When a toilet is flushed in a town or city, the wastewater flows through sewer pipes and eventually ends up at a treatment plant. Microorganisms that could be harmful to human health or the environment are removed from the water before it is released. But if a toilet is flushed outside of a municipality, such as in a rural area or in an otherwise unsewered region, where does the wastewater go, and how is it treated? Most rural homes and businesses have a septic system buried underground to treat their wastewater. Groundwater to dilute any remaining contaminants. Figure 1. The most common way to treat and dispose of wastewater in rural homes is through an onsite (unsewered) disposal system. The majority of onsite disposal systems in the United States are septic systems. It is interesting to note that the force of gravity is all it takes to operate a septic system, and the only input is wastewater. If a septic system is designed and used properly it will eliminate many health or environmental risks from wastewater. Unfortunately, not all septic systems meet these standards, and some have serious negative impacts on local water quality. The first step of treatment in a septic system is in the septic tank. Wastewater is held in the septic tank about a day. During this time the force of gravity causes fat and other lighter-than-water particles to form a scum that floats to the top. Particles that are heavier than water sink to the bottom, and are collectively called sludge. This treatment results in the middle layer of the septic tank containing wastewater with very few solids. When more wastewater is added to a septic tank, the same volume flows out, but the water that leaves the tank has had most of the solids removed. The outflow water still contains bacteria from the human digestive tract and most of the chemicals that were dumped down the drain at that home or business. Some digestion of the solids takes place in the septic tank, but since there is no oxygen in the tank, this breakdown of solids is very slow. 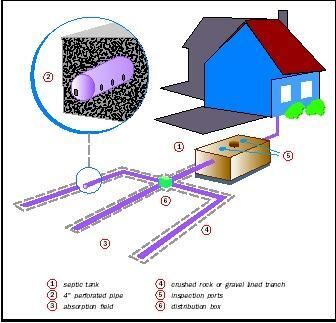 Wastewater flows from the septic tank to a drainfield—sometimes called leach lines or soil absorption area. The drainfield is a series of buried pipes, commonly plastic, with holes in them. Wastewater seeps through the holes in the pipes and soaks into the surrounding soil. Figure 2. The soil acts as a natural and very effective buffer to filter out many harmful bacteria, viruses, and excessive nutrients. 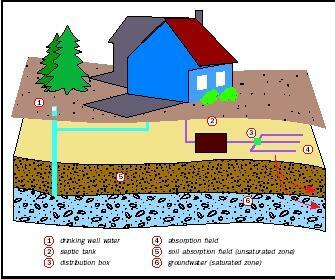 However, some contaminants from a septic can still reach the groundwater, which might be the source for a drinking-water well on an adjoining property downgradient. pipe about 4 inches (10 centimeters) in diameter with holes at regular intervals, adding more gravel, and finally replacing the soil. The length and depth of a drainfield is based on the number of people using the facility and the characteristics of the soil and geology at the site. Not all drainfields in existence are adequate to treat wastewater to modern standards. New drainfield construction methods that do not use gravel are being tried in some areas. Soil provides most of the wastewater treatment in septic systems (see Figure 2). As the wastewater moves downward by gravity, the soil binds or filters many of the harmful bacteria and viruses, holding them until they die or are eaten by other microorganisms living in the soil. Some chemicals may be bound to soil grains or changed by reactions in the soil to safer forms; however, many products dumped down the drain end up soaking all the way to groundwater. An end product of wastewater treatment by septic systems is nitrate (NO 3 − ). Nitrate is formed in soil from the breakdown of nitrogen-rich proteins in wastewater. If septic systems are far apart, the huge volume of groundwater in the surrounding area usually dilutes the nitrate. In some situations, especially where septic systems are on small lots or natural rainfall is low, septic systems have contributed to elevated levels of nitrate in groundwater. A septic system must be properly designed and maintained for it to treat wastewater. The septic tank needs to be large enough for the volume of wastewater sent to it. For a typical home, a tank holds from 1,000 to 1,500 gallons (3,790 to 5,685 liters). The solids need to be removed from the tank every few years. If the septic tank is too small, or the volume is taken up with solids, too many large particles will be sent to the drainfield and clog the soil. Once this happens, wastewater will not drain downward. Instead the wastewater will saturate the soil above the drainfield, and eventually pool on the surface (that is, if the lines do not clog first and cause the toilet to back up). A drainfield can also be damaged by activities that clog the pipes or compact the soil, such as invading tree roots or driving automobiles or heavy equipment over the area. If water surfaces above a drainfield, then it has not been treated adequately by the soil; as a result, it presents the same risks as raw human sewage. If this wastewater reaches a stream—either directly or carried in rainwater runoff—diseases can be spread, and the nutrients in the water will encourage excessive algae growth that can deprive fish of oxygen. If this wastewater enters a drinking-water well, the residents will be drinking human waste. There are many septic systems in use today that lack one or more of the functional components necessary to treat wastewater. For example, many drainfields lack the depth of soil beneath the leach lines necessary to filter and bind microbes before the water reaches groundwater. Some drainfields are located so close to streams that the wastewater seeps into the waterway via a natural underground connection. A drainfield properly located but failing to operate properly can cause wastewater to rise to the land surface, thereby contaminating nearby streams and lakes. Some septic tanks may not even be connected to a drainfield—the wastewater outflow just runs down the land surface. A number of steps have been taken to help reduce the water quality impact from septic systems. Most states have standards for constructing new septic systems and repairing systems that fail to operate properly. Monitoring of groundwater and surface water detects areas where septic systems are contributing to water quality problems. New designs are being developed to better treat wastewater in situations where a standard septic tank and drainfield falls short of adequately treating wastewater. Septic system owners are now commonly provided with publications describing the importance of proper maintenance. And finally, the heightened awareness of the risks from hazardous household chemicals and sewage, along with greater opportunities for safe disposal, should minimize such contaminants from entering groundwater through septic systems. Proper Disposal of Household Chemicals. Septic systems do not address contaminants other than microbes. Hence, they allow nitrogen and household chemicals that are improperly disposed down the drain to discharge to groundwater. Degreasers, drain cleaners, bug killer, paint, gasoline, garden chemicals and used motor oil are among the chemicals that should never be dumped down the drain or into a storm sewer. The best option for disposal is usually for the consumer to use up or degrade the product according to directions, or to take it where proper disposal procedures are used. When in doubt, a person should check with the local garbage collection company for disposal recommendations. In many communities, motor oil and latex paint are recycled. If there is no current access to a household hazardous waste collection facility, the person should consider storing the product securely until the service is available. If the product is supposed to be mixed with water for use in the home, like laundry detergent, then it is suitable to pour it down the drain if it is disposed according to directions. Beyond that, the only things that should go down the drain are water, human waste, and toilet paper. SEE ALSO Chemicals from Consumers ; Chemicals from Pharmaceuticals and Personal Care Products ; Groundwater ; Microbes in Groundwater ; Nutrients in Lakes and Streams ; Pollution of Groundwater ; Pollution of Lakes and Streams ; Pollution Sources: Point and Nonpoint. National Small Flows Clearinghouse. "Basic Wastewater Characteristics," 1997. Pipeline 8(4):1–8. Available online at <http://www.nesc.wvu.edu/nsfc/pdf/pipline/PLf97.pdf> . National Small Flows Clearinghouse. "A Homeowner's Guide to Onsite System Regulations," 1998. Pipeline 9(1):1–8. Available online at <http://www.nesc.wvu.edu/nsfc/pdf/pipline/PLw98.pdf> . National Small Flows Clearinghouse. "So . . . Now You Own a Septic Tank." In Septic System Brochure Series. Morgantown, WV: National Small Flows Clearinghouse. Available online at <http://www.nesc.wvu.edu/nsfc/pdf/septic%20news/Septic_Tank1.pdf> . Novotny, V., and H. Olem. Water Quality Prevention, Identification, and Management of Diffuse Pollution. New York: Van Nostrand Reinhold, 1994. How do I identify a septic system vs a sewer? I perform HUD inspections and constantly run into the situation where a property is supposed to be on a septic system, but there is nothing above ground to show it except some discoloration or imprint in the lawn where the dig site had been. Any suggestions?